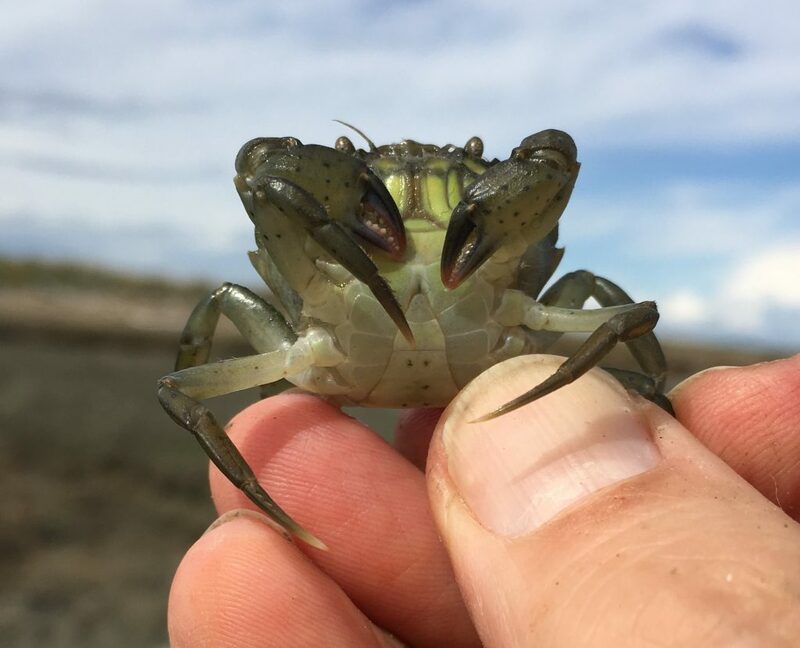 So far this year, 42 of the invasive crabs have been found on Dungeness Spit, compared to 96 for all of last year, according to Lorenz Sollman, deputy project leader for the Washington Maritime National Wildlife Refuge Complex. European green crabs have been found on Graveyard Spit, the small spit that juts off the main Dungeness Spit. So far, nobody knows if the first crabs to arrive on the spit are reproducing or if the young ones being found there are new arrivals. Crabs can travel great distances through the water in larval form before they settle down and take on the familiar appearance of a full-grown crab. “We don’t have any reason to think that they are not reproducing (at Dungeness),” said Emily Grason, Crab Team coordinator for Washington Sea Grant. The Crab Team is a group of volunteers and experts who monitor 54 trapping sites in the region. Just this morning, Crab Team members found a new green crab at Dungeness Landing County Park, west of the Dungeness River and just outside the Dungeness National Wildlife Refuge. 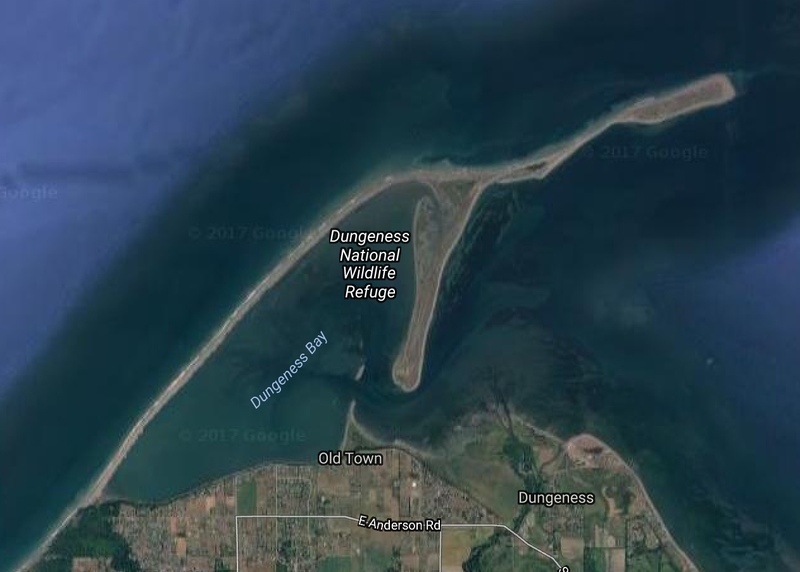 “We’ve had our eye on that site, since it’s so close to the Dungeness Spit and assumed it was only a matter of time before one showed up there,” Emilly wrote me in an email. Meanwhile, in Makah Bay just outside the Strait of Juan de Fuca in the Pacific Ocean, nearly 400 crabs have been captured in an intensive trapping effort this year alone. The first crab was spotted in the bay last fall. 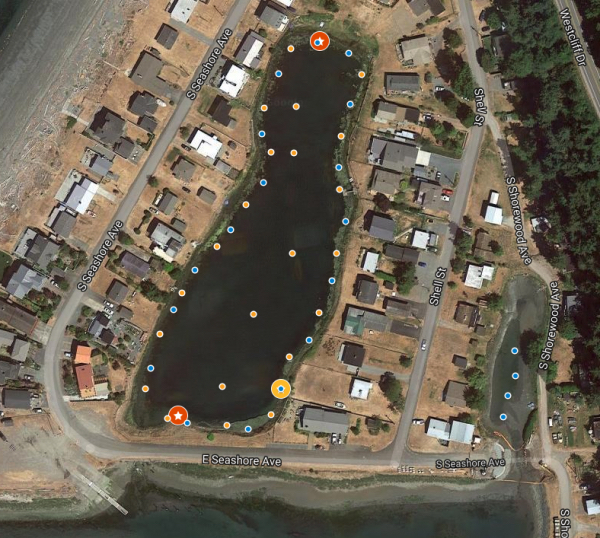 Matthew Nash of the Olympic Peninsula News Group updated the situation this week — although it is Makah Bay, not Neah Bay. The latter, which is technically inside Puget Sound, has not been found to have any green crabs. At the beginning of this month, one of the most intensive trapping programs yet in Puget Sound was conducted over three days at Lagoon Point on Whidbey Island, where two green crabs were caught on different days last year. Working in deep sticky mud, only one green crab was caught in the enclosed lagoon during the latest effort. 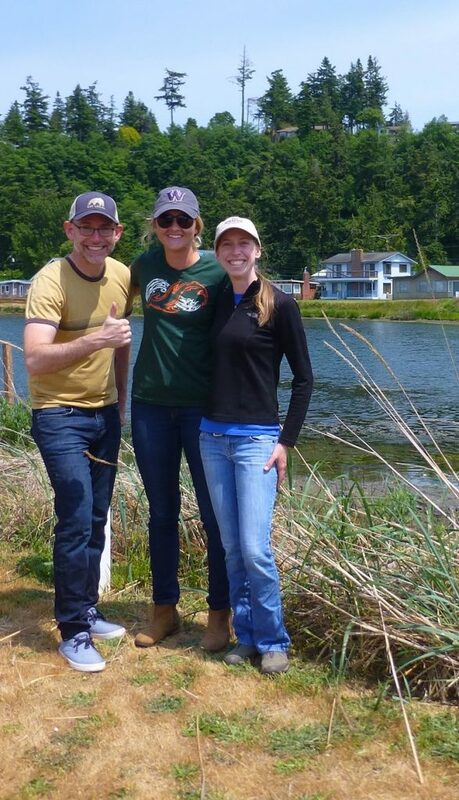 Crab Team leaders Sean McDonald, Kelly Martin and Emily Grason following their three-day trapping effort on Whidbey Island. “While we might have been happier not to catch any green crab, we are certainly glad that we only found one,” wrote Kelly Martin for the Crab Team Blog. Kelly, the newest member of the Crab Team management group, goes on to talk about the trapping adventure — including her accidental sit-down in the mud. In a previous blog post, Kelly, who is a graduate student at the University of Washington, introduced herself to readers and talked about her background. It has been suspected that the European green crabs found at Dungeness Spit as well as those on San Juan Island and Padilla Bay may have originated from Sooke Inlet at the southern tip of Vancouver Island, where a large infestation of green crabs has become well established. After all, Sooke Inlet is physically close to areas in Puget Sound where green crabs have been found, at least when compared to infested areas along the coast. Although a large channel separates the U.S. from Canada, that might not be much of an obstacle for crab larvae, which drift with the currents. To the surprise of many, a research project involving crab DNA showed that the green crabs in Puget Sound were NOT closely related to those in Sooke. Instead, the crabs at Dungeness Spit came from coastal populations, according to genomics work by Carolyn Tepolt of Woods Hole Oceanographic Institution. The Sooke population is considered genetically isolated and very different, probably because it started some time ago by a small number of crabs that did not mix with others. At the same time, studies of the tidal currents in the area showed that Sooke was no more likely to be a source of crab larvae than coastal areas. Crab larvae coming from Sooke are likely to be swept toward the ocean, whereas rare conditions called “reversals” can bring larvae from the Washington Coast along the southern shore of the Strait of Juan de Fuca, according to a study by Elizabeth Brasseale, a graduate student in oceanography at the University of Washington. See the Crab Blog from April 25. Knowing that Sooke is not the source of the green crabs in Puget Sound changes the dynamic with Canada. The cost of eradicating green crabs from Sooke would be enormous and probably would not help the situation in the U.S. On the other hand, the Canadians may learn some things from the extensive trapping program taking place in Puget Sound, which seems to be keeping the crab population in check. Sooke may be somewhat of a lost cause, but there could be hope for other B.C. inlets at risk of being invaded. A cross-boundary task force has been discussing the green crab problem on both sides of the border. Meanwhile, an expert panel at April’s Salish Sea Ecosystem Conference discussed the pros and cons of international cooperation as well as political realities of dealing with the problem. Kelly Martin summarized that session for the Crab Blog on April 27. The first publication addressing Puget Sound’s European green crab invasion documents the early stages of a horrific invasive species while celebrating the collaborations of hundreds of people making detection and control possible, according to Emily. Allen Pleus, coordinator of Washington’s Aquatic Invasive Species Program. “If you are familiar with Crab Team, you might wonder why this scientific paper, which only covers the findings through the end of 2016, is important,” Emily Allen wrote in the Crab Team Blog. “We have certainly been sharing news about findings through our blog, the media and other outlets. As with most scientific papers, the information shared with the world lags behind current events, yet it reaches a depth of information that will be most helpful for those working with European green crabs, invasive species and related subjects. Although trapping European green crabs has been effective at locating the early stages of an invasion in Puget Sound, imagine instead taking a water sample and sending it to a lab. After a short wait, a technician using DNA techniques would tell you the likelihood of finding crabs in that location. This is the ultimate test that I’m imagining as a new effort gets underway to identify invasive species by looking for DNA floating in the water. The technique is known as environmental DNA testing, or simply eDNA, and it is increasingly being used in freshwater to look for the presence of species of interest. Developing a technique for saltwater adds the complexity of tides and currents moving DNA around, chemical breakdown of DNA, and determining if the DNA signal is coming from the larval form of a species or reproductive adults. Alison Watts, an environmental engineer at the University of New Hampshire, has received a two-year, $500,000 grant to study eDNA in marine estuaries. She is collaborating with researchers at sample sites in Oregon, Maine and New Hampshire. The idea is to use eDNA techniques alongside traditional methods of biological sampling, such as seining, trapping and electrofishing. The eDNA samples undergo both “meta-barcoding,” which can identify DNA from multiple species in a single sample, and single-species PCR amplification, which is designed to test for the presence or absence of a target species, Alison told me. The eDNA techniques might provide an early warning of green crabs — say in South Puget Sound, where they have not been found before — but it would not provide information about the number of crabs or their physical conditions. Didn’t I read once that on the East Coast there is no season or limit on the taking of green crabs? Also, I recall the article mentioned that they were delicious! A similar promotion here might help keep them in check.